This ultra quiet 2 shelf 28" long x 19" wide Platform Truck features a 700 lb capacity and has a special design intended for situations when it is of utmost importance for you not to make noise while you are transporting your loads. It is designed with Natural Rubber Caster with Precision Ball Bearings that provides quiet and smooth working conditions. The Truck is mounted on two 4" rigid casters at the handle end and two 4" swivel casters at the front. The platform is made with slip-resistant discs to aid load retention. 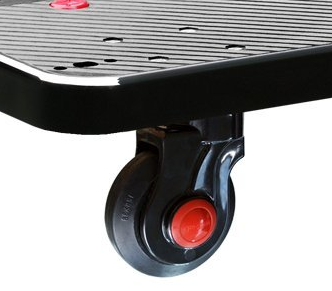 The impact, crush and puncture resistant structure is manufactured for an exceedingly long Lifecycle and is designed to last longer than the traditional plastic style platform trucks. Great for wash down and clean environments, hotels, restaurants, warehouse, office, schools, etc... storage and transportation carts. High-density polyethylene(HDPE) bed is significantly lighter than standard platform carts. Please Note: This video is of the similar 1 shelf model. Natural Rubber Caster with Ball Bearings Provides Quiet, Smooth Working Environment.